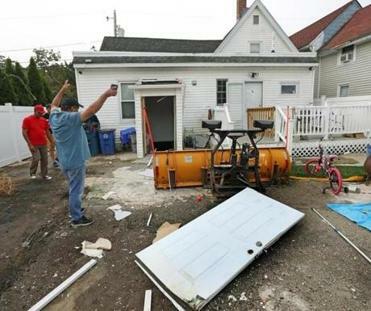 LAWRENCE — With frustration mounting across the Merrimack Valley, Governor Charlie Baker declared a state of emergency Friday and called in another utility to handle the response to the series of gas explosions and fires that killed one and displaced thousands a day earlier. Baker, facing growing outrage from the residents of Lawrence, Andover, and North Andover, criticized how Columbia Gas, the utility that provided gas to the dozens of destroyed homes, had responded to the disaster and placed Eversource in charge. “We believe that will make a big difference with respect to the relationship between what gets told to us and to what actually happens on the ground, and the representations that are made to people in these three communities, so we can do everything we can to ensure their homes and communities are safe,” Baker said at a press conference. Lawrence Mayor Daniel Rivera put it more bluntly. Habitantes de tres comunidades ubicadas en el Valle del Merrimack se encuentran este viernes enfrentando las secuelas de una crisis de gas natural que causó 60 incendios y la muerte de un joven residente de Lawrence. Speaking publicly for the first time since the gas fires erupted, Stephen Bryant, president and chief operating officer of Columbia Gas, on Friday expressed his “sincere, deepest condolences” to family of Leonel Rondon, the 18-year-old killed when a chimney collapsed on the car he was sitting in, while defending his company’s performance. Bryant said the company had 107 contractors and 189 employees in the field, and another 100 were expected from Columbia’s affiliates in Pennsylvania and Ohio. The governor’s declaration came as the National Transportation Safety Board arrived in the Lawrence area to begin probing the cause of the fires. Hundreds of officials and utility workers began going house to house to shut off gas meters and conduct safety checks. About 8,600 homes and businesses in the three affected communities had been evacuated after fires and explosions ripped through the region Thursday afternoon, sparking fear, confusion, and gridlock overnight. As many as 80 buildings burned. Lawrence General Hospital reported treating 13 victims with injuries ranging from smoke inhalation to blast trauma. One person remained hospitalized and was undergoing surgery Friday. Officials said they believe the fires and explosions may have been caused by overpressurized gas lines but cautioned the investigation is just beginning. Columbia Gas, which serves about 50,000 customers in the Merrimack Valley, has said it was upgrading equipment in the area when the explosions and fires erupted. On Friday, schools in the three communities were closed, stoplights were off, and streets were eerily quiet, as crews of law enforcement officials, aided by locksmiths, entered vacant homes to shut off the gas before allowing anyone to return. There was no estimate of how long it would take officials to clear all the thousands of affected buildings before residents would be allowed to move back in. The lack of clear information infuriated residents throughout the region, some of whom were staying in shelters and still rattled from the fires and explosions. At the First & Main Marketplace in North Andover, two Columbia Gas representatives who showed up late for a briefing for residents hustled back to their cars when they were peppered with questions they could not answer. “I have no idea whether we can move into our house or not. Is it safe?” said Chris Allen, a Belmont Street resident. “I really think you should have come here with more information,” said James Hassam, a retired firefighter. “We don’t have answers right now,” said one representative, who would not give her name. “So you’re saying it’s not safe to go back into our home?” another person asked. Hassam said he was dismayed by the company’s inability to help its customers. “When you come here and you try to get answers they don’t have, it’s unsettling,” he said. Baker had initially called Columbia Gas’s response to the disaster “adequate,” but as anger at the company mounted throughout the day, he accused the utility of not keeping its word. “On a number of very significant issues, we heard one thing, and something else happened,” Baker said Friday afternoon. Rivera, at the same press conference, recounted Columbia Gas asking him to evacuate everyone in South Lawrence, then asking him to get the power shut off there. Bryant said Columbia Gas has set up a claims hot line for customers, 1-800-590-5571. On Jefferson Street in Lawrence, Christel Nazario, who lives across the street from the house that was destroyed by fire, said she was glad to hear Columbia was off the job. They pointed out that Columbia Gas was responsible for a 2012 explosion in a Springfield adult entertainment club, in which 18 people were injured. That explosion was blamed on a worker who punctured a gas line while checking for a leak. Columbia Gas agreed to pay the city of Springfield a $850,000 settlement. Robert J. Chipkevich, a retired National Transportation Safety Board official who headed the pipeline accident investigation program for 15 years, said he was struck by the large number of building fires spread over such a large area. He said if overpressurization was to blame, it could have been caused by human error — someone opening a valve — or a mechanical failure on a control valve. He said once additional pressure enters a pipeline, it can quickly flood homes across the system with flammable gas, which can then be ignited by a pilot light on a stove, a hot-water heater, or an electric spark from a light switch. He said investigators will have to work methodically to trace the problem back to its source. Rivera, speaking in Spanish and English at a press conference, sought to reassure undocumented immigrants worried about the flood of state and federal agents responding to the gas explosion. Rivera also told Lawrence residents not to suspect racial discrimination if they see residents of the wealthier, whiter communities of North Andover and Andover returning to their homes first. Rivera said it may simply take longer to ensure Lawrence is safe because of its density, large population, and older housing stock. On Jefferson Street in Lawrence, neighbors gawked at a home that suffered catastrophic fire damage, the smell of smoke still lingering in the air. “It’s so sad what happened here,” said Ricardo Favian, who lives nearby. He stayed in his home Thursday night, but questioned how Lawrence residents could feel safe when power is restored. Jacklin McKenzie of Methuen was visiting her grandparents on nearby Hamlet Street when she heard the massive explosion Thursday evening and then saw the black smoke billowing from around the corner. “I don’t even know how to describe how loud that noise was,” she said. Laura Crimaldi, Victoria McGrane, Martin Finucane, and Andy Rosen of the Globe staff contributed to this report.